Tanbi Music launched in 2014 and the first product launched by Tanbi Music was their MT560GB metronome tuner. They have since launched a line of guitar picks as well. 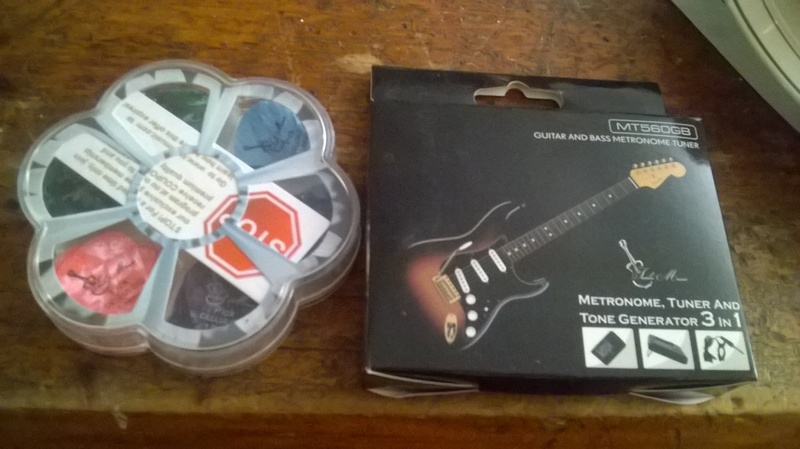 I was recently sent their MT560GB metronome tuner and 60 guitar picks for my husband to review. The MT560GB metronome tuner is easy to use and dependable. It makes flat tuning easy and Clip-on pickup included, for ultra-sensitive accurate tuning. It has a large display screen for easy reading and the auto tune features is great for Guitar or Bass. The loud metronome has adjustable volume control, and a lot of flexibility in Rhythm, Tempo and Beat. You can switch between 8 rhythms, 9 beat types, and a wide range of tempo selection (30-230bpm). The MT560GB metronome tuner can be used on acoustic guitar, electric guitar, bass, 12 string guitar, violin, ukulele (uke), mandolin, and banjo. It takes three AAA batteries which are included. The guitar picks are made from celluloid which allows for a nice tone, easy grip and they don’t tear easy. You receive a selection of 5 different gauge sizes, thin, medium and heavy: 0.6mm, 0.73mm, 0.88mm, 1.mm and 1.14mm and they are different colors for easy choosing. The case is high quality and can easily be stored in your case or gig bag without worrying it will spill. You can even fit up to 100 picks in the case! My husband really loved the tuner! It made tuning his new guitar easy and convenient. The metronome comes in handy and my husband loved the versatility. My husband loved the guitar picks as well and really liked that they were colored for easy chosing. We were both impressed with the quality and the affordability of the items Tanbi Music has to offer. The tuner sells for $19.50 on Amazon and the guitar picks sell for $14.99 on Amazon. would be an amazing thang to have !